The Cara Cold Therapy Ice Bag is designed to help aid your comfort and alleviate fever symptoms or aches and swelling. 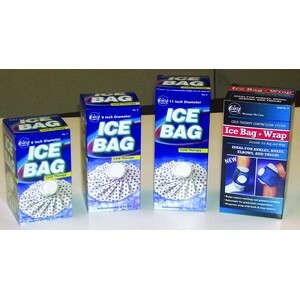 This ice cold bag has a 9-inch diameter that fluffs out for wide coverage. The 1 pk Cara Cold Therapy Bag contains dry natural rubber and is made to rest easily on a variety of places on the body, including the head. New durable water-proof fabric electra mechanically sealed. Cold Therapy used for the treatment of muscle strains and sprains.